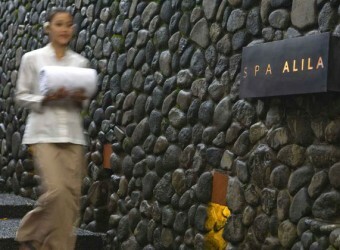 Bali Spa Alila Ubud is in a traditional village of Payangan in Northern Ubud which is surrounded by quiet nature. Spa Alila is in the building which provides hospitable services including treatments using organic products in a peaceful atmosphere. Traditional Balinese Massage is a combination of gentle stretch and acupressure using unique blends of Indonesian essential oils to stimulate blood circulation to loosen muscle. A combination of ancient Indonesian and Chinese techniques improves blood circulation, prevent illness and release pressure. It also cures fatigue and relieves stress. This is traditional massage with warmed stones to increase a body temperature by placing the stones on energy points of the body to open up the capillary and improve blood circulation. All the stress you have will be gone and you will be in a deep relaxation. For Women in pregnancy. The massage doesnt impose a burden on a body and offer for 3month ~8 month pregnancy women. Available for children from 5 to 10 years old. The treatment begins with Ayurvedic massage to relieve stress and tensions, and then a steady stream with warm oil is poured continually down on your third mind eye in the centre of forehead to bring clarity and peace to body, spirit and mind. Other areas: No service is available. Please check our Driver Service! Any children who are over age 5 can take treatment, Children Massage. Men who book Facial for Him are recommended to shave before the treatment. I took this menu when I went sightseeing to North Bali. There is a great spa in the secluded place. I enjoyed spectacular view of the valley.